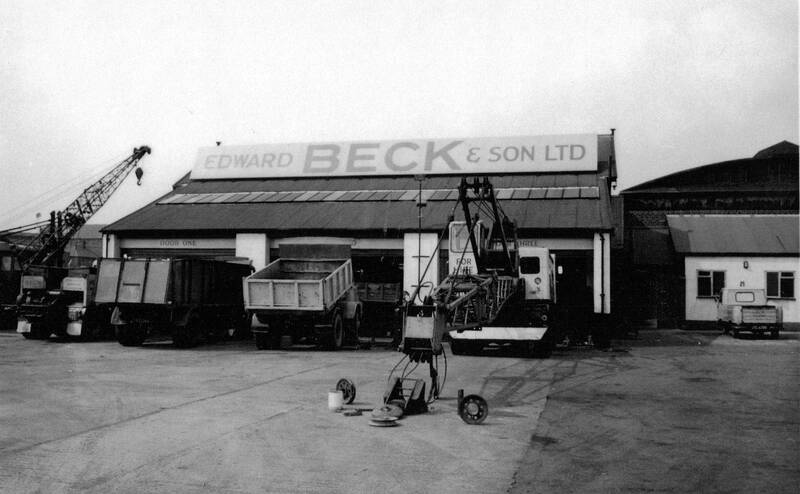 The main depot of Edward Beck & Son Ltd was located on Greg Street Reddish near Stockport. 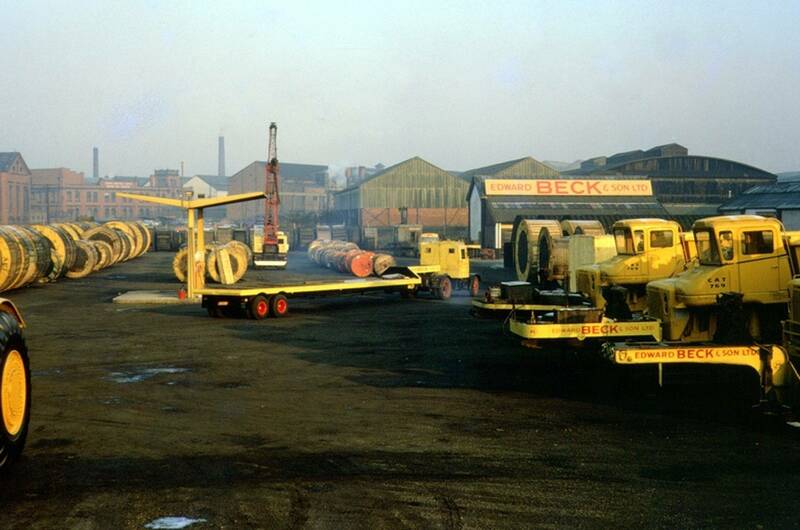 The site, which was around six acres in size, consisted of Beck's head office, garage, trailer workshop, fuel island and plenty of storage space for the vast amount of Caterpillar & International equipment. 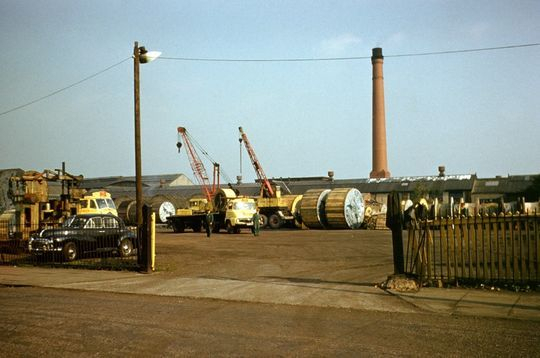 It also was used as a storage depot for the hundreds of cable drums which were distributed across the UK during the extensive upgrading of the high-voltage electric power transmission network, otherwise known as the national grid. Teddy Beck takes time out for a light hearted photograph in 1954 with the local scrap dealer who would call into the depot and take away any surplus material. 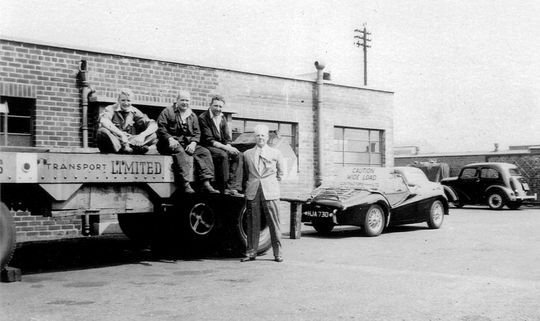 In the foreground from left to right are Tony Hogg (apprentice mechanic) Len Etherington (driver) Teddy Beck and Ronnie Wiggins (apprentice mechanic). Mechanic Ken Hough takes time out for a picture in the depot at Greg Street on one of the company's Thwaites built dumper trucks in 1960. Note the service van in the original Edward Beck blue and gold livery. 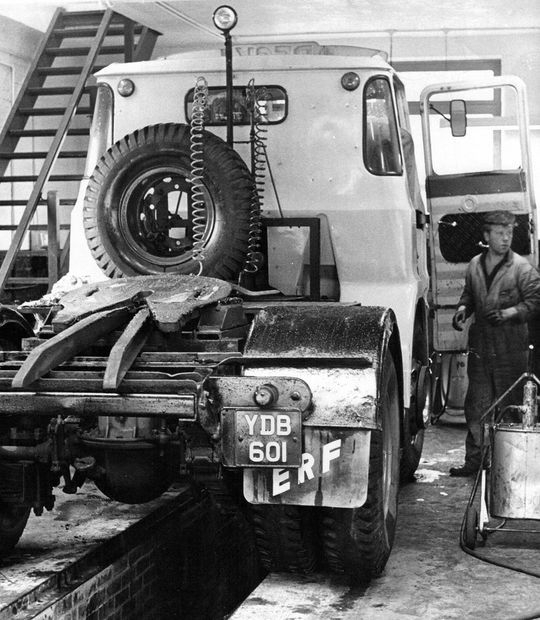 This ex Ministry of Defence Austin 6x4 was powered by a six cylinder 4 litre petrol engine. It was used mainly as a recovery truck and was fitted with an overhead gantry and block and tackle which enabled it to tow broken down vehicles. You can view the whole film by clicking here. 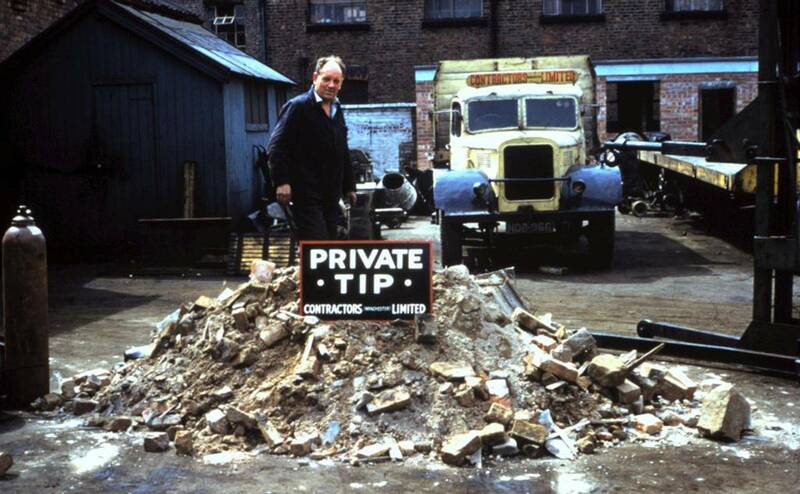 Driver Fred Pilkington takes time out for a photograph after a pile of rubble was accidentally tipped in the yard. While doing some maintenance work on a tipper it went unnoticed that the tail gate was open and the rubble slid out off the back when the rams were raised. Some of the staff take time out for a photograph outside Edward Beck's original office block on Greg Street in Stockport. 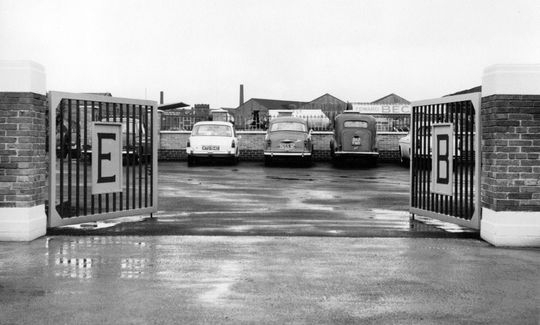 Edward Beck's Greg Street depot main entrance in 1960. 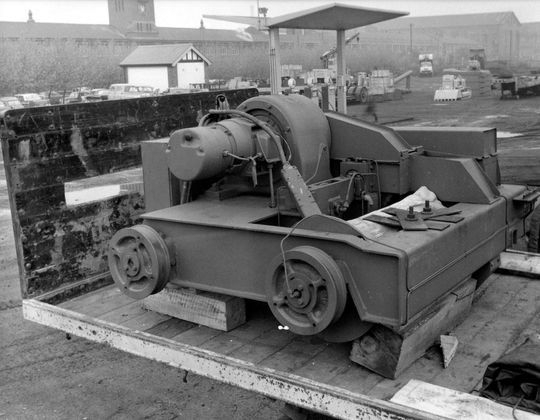 As with all images on this page to view it full size just click on the picture. 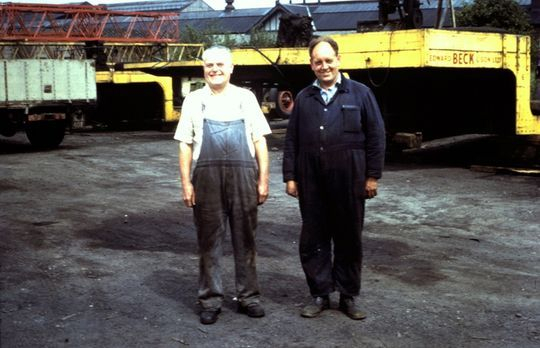 On the left is mechanic Jim Pott and and on the right driver Fred Pilkington. 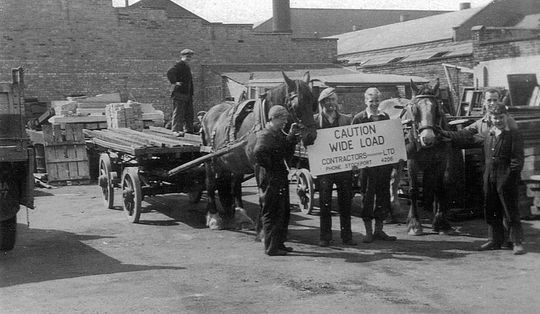 They are pictured here while taking a break in the depot at Greg Street in 1960. 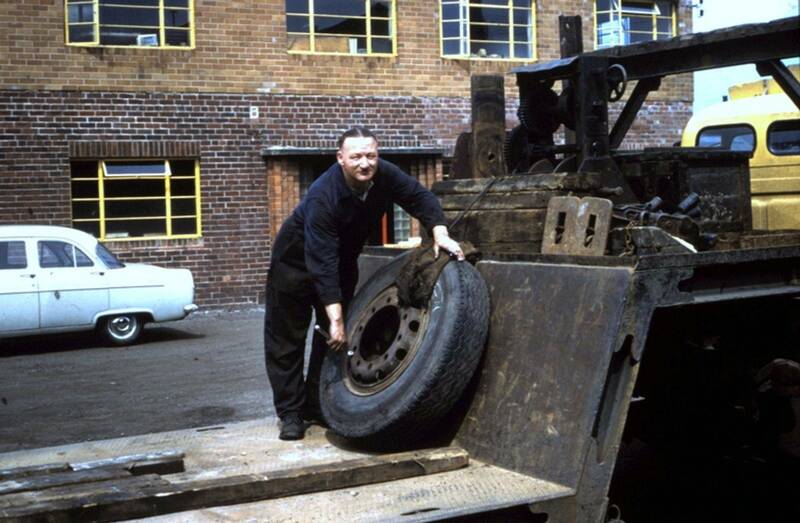 Seen here outside the old office block at Greg Street in 1960 Tom the tyre fitter was one of several tyre fitters the company employed at that time. 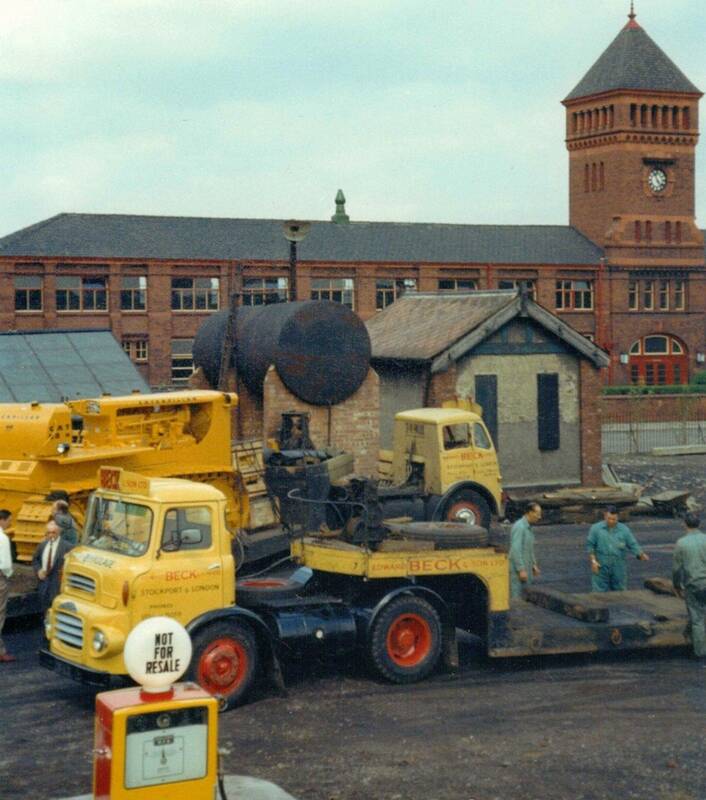 otherwise known as the National Grid, this was the scene in the depot at Greg Street. Hundreds of drums of electric cable were stored on site awaiting distribution across the whole of the UK. Commer QX TS3 4x2 tractor unit Reg No PJA 878 is seen here parked in the depot along with a number of the company's low-loader trailers. 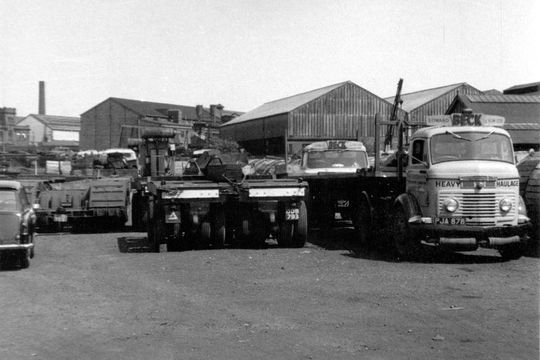 A busy scene in the depot in 1963 with an Albion Clydesdale 4X2 tractor unit coupled to a four-in-line low loader parked next to a FG Foden loaded with a Caterpillar bulldozer. Some of the hundreds of electric cable drums that were stored around the depot at anyone time. 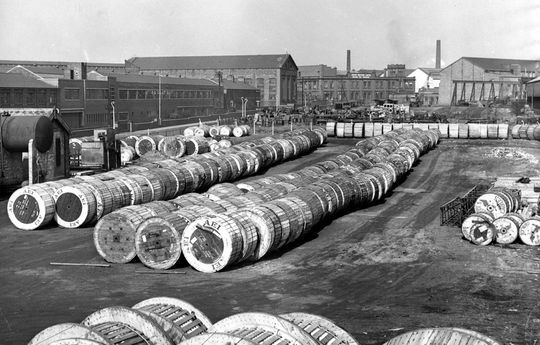 In the background are the premises of Craven Brothers of Stockport, who were world renowned machine tool engineers. 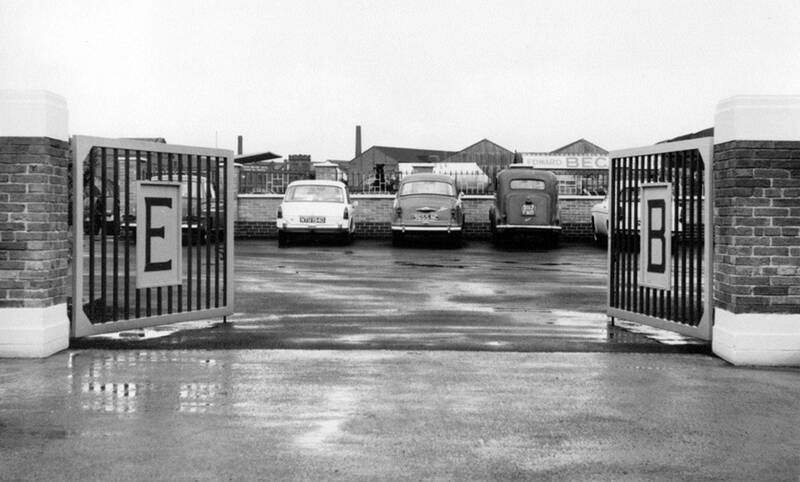 1966 and a new entrance to the Greg Street depot was built along with the installation of new gates. A group photo of drivers and staff taken opposite the depot on Greg Street. At the moment we are missing four names. If you can put a name to the faces please get in touch. ??. Henry Parker. ??. Slim Griffiths. Joe McHale. Vernon Macro. Arthur Fryers. Dave Porter. Jimmy Etchells (foreman driver). Billy Peters. Jimmy Peters. 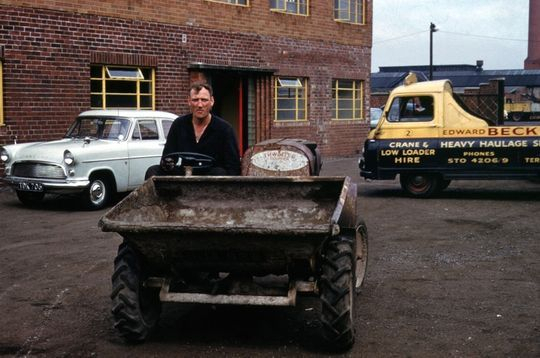 Jack Bradshaw.??. Colin Howells. Fred Pilkington. 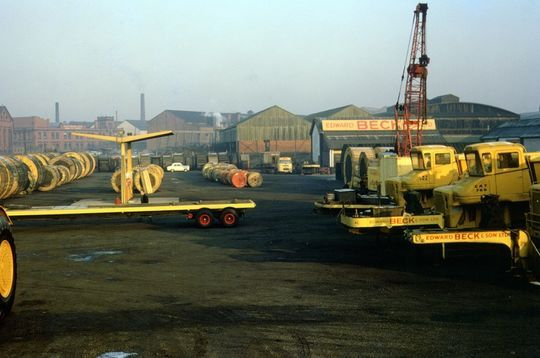 Coles Dominant 15 ton mobile crane Reg No TDB 936, seen here at work in the depot at Greg Street lifting cable drums, was operated by Derek Bolton. 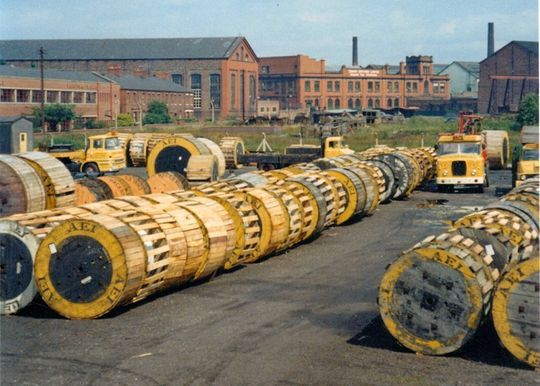 Primarily to store the huge variety of cable drums and Caterpillar equipment the Greg Street depot covered an area of around six acres. 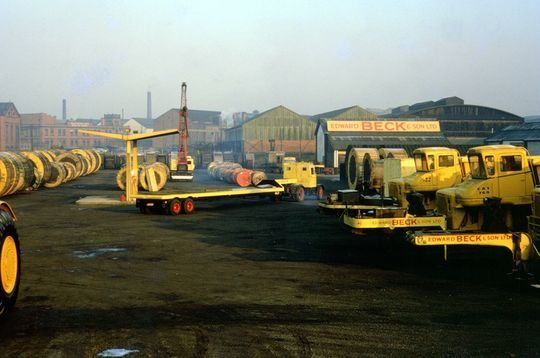 Another depot shot taken in 1968 showing the vast amount of cable drums and Caterpillar equipment stored on site. 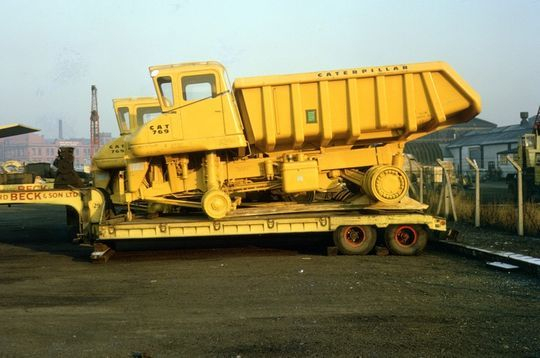 Three Caterpillar 769 dump trucks awaiting onward delivery. A close up shot of a Caterpillar 769 dump truck on the back of a low-loader awaiting onward delivery. 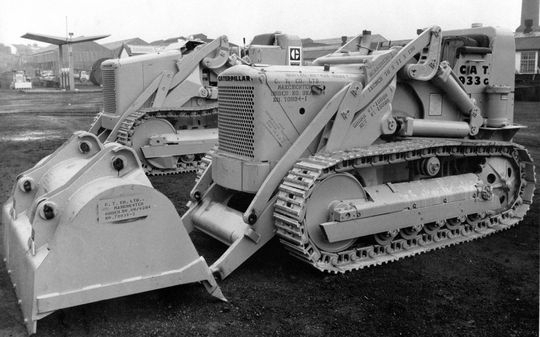 Caterpillar started its 50-year history with off-highway truck manufacturing with the 769, which had a target payload of 35 tons and was powered by a 400-horsepower (298-kilowatt) Cat engine. 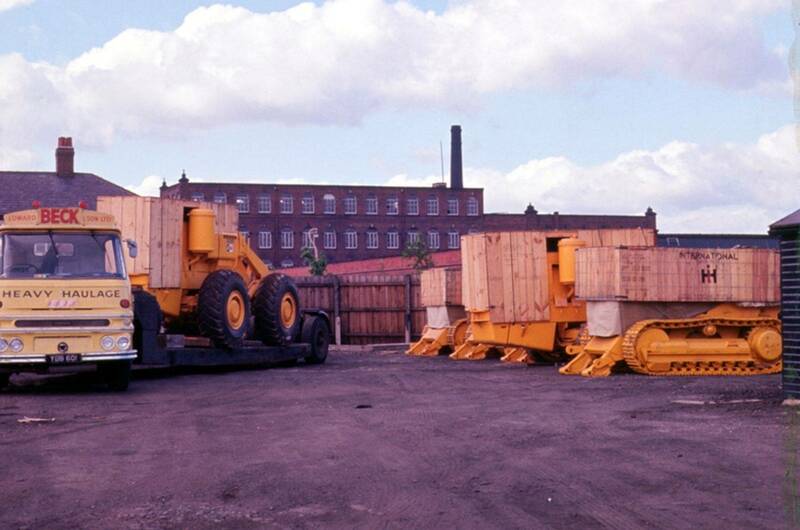 More Caterpillar plant equipment stored in the depot at Greg Street awaiting onward delivery. 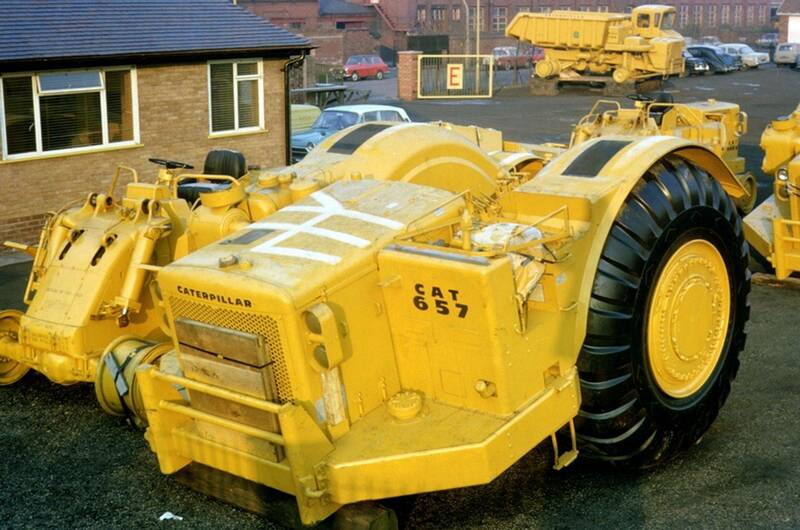 The storing of Caterpillar equipment at Greg Street saved Caterpillar a fortune in quayside fees at the docks. 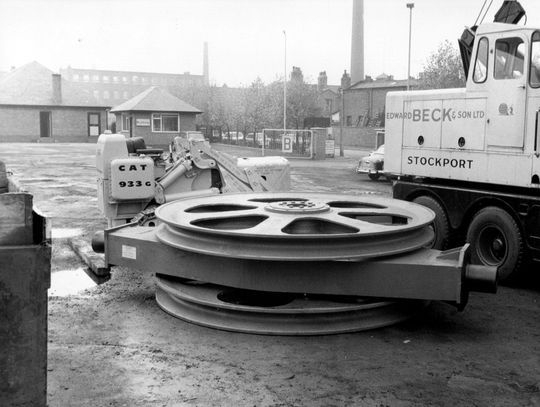 Staff get to grips with unloading more Caterpillar equipment for storage in the depot at Greg Street. This bucket was just part of the equipment for a large excavator called 'Big Geordie' which, at the time, was Europe's largest excavator located in a massive opencast mine near Morpeth in County Durham. It was transported in sections from Salford Docks to Morpeth in 1968 with many other parts of the huge excavator stored around the depot in Stockport until they were required on site. Transported in sections to Morpeth in 1968 these were more pieces of equipment which were to become the large excavator known as 'Big Geordie'. 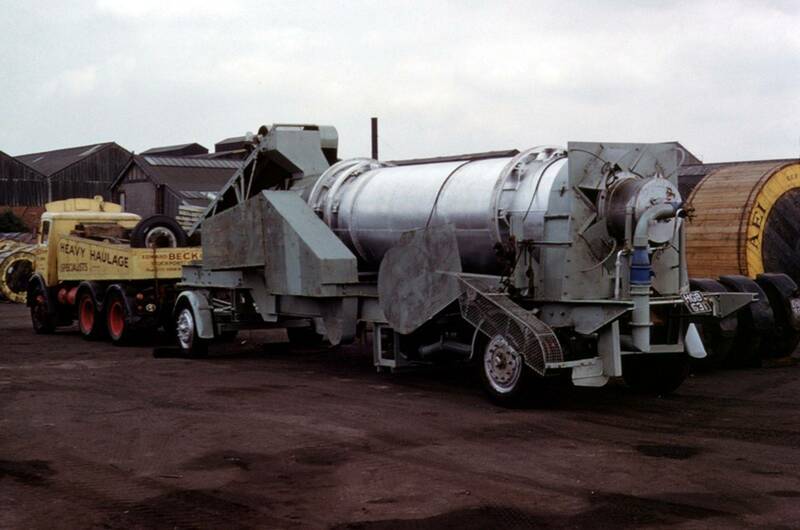 Note the ERF loaded with drums of electric cable parked on the fuel island. 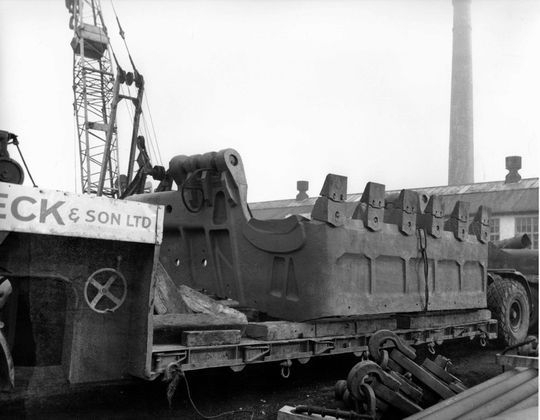 Another piece of 'Big Geordie' awaiting delivery to Morpeth in 1968 which, at the time, was Europe's largest excavator. 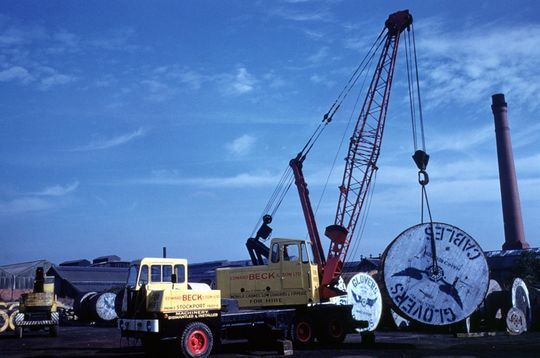 Lying on the ground in the depot at Greg Street while awaiting delivery is another huge piece of 'Big Geordie' which was, at the time, Europe's largest excavator located at Morpeth in County Durham. 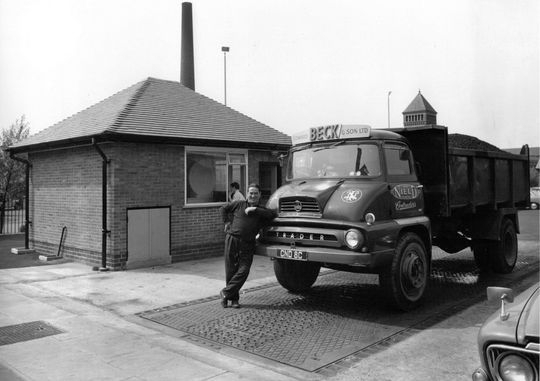 The company's purpose built weighbridge and office in 1967. 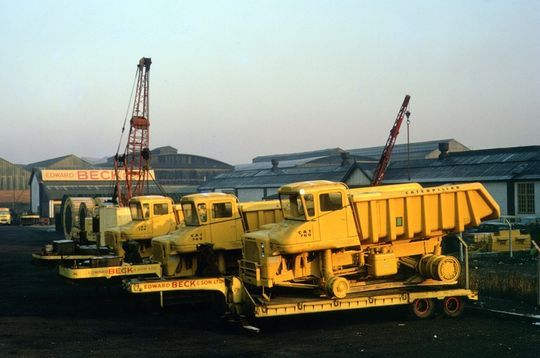 The Thames Trader four wheeler tipper, Reg No CND 8C, was one of a number purchased by Edward Beck along with other various plant equipment after the closure of Thomas Nield. 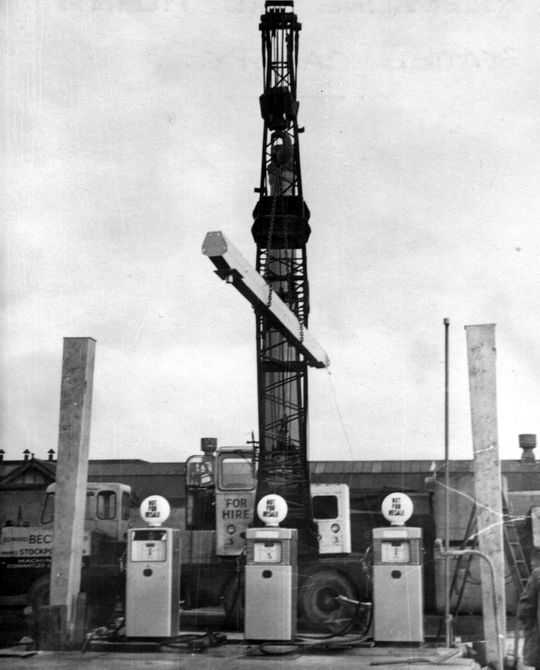 In 1967 Edward Beck built their own fuel island at Greg Street. The completed fuel island at Greg Street depot in 1967. 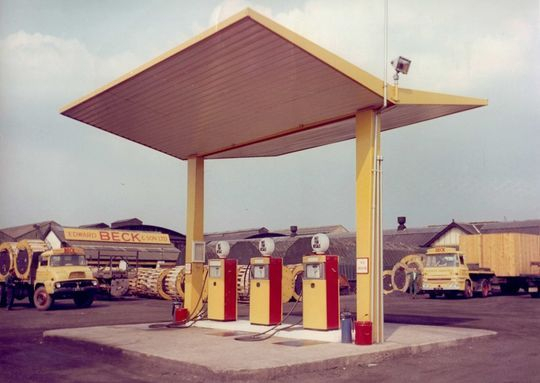 Design and construction was relatively easy, as Beck's also built most of the Shell petrol stations in the North West of England during the 1960's. This great period shot shows a few of the Thames Trader tippers in the fleet, along with a BMC tackle wagon. Also if you click on the picture and view it full size you will see on the left a locomotive awaiting delivery. 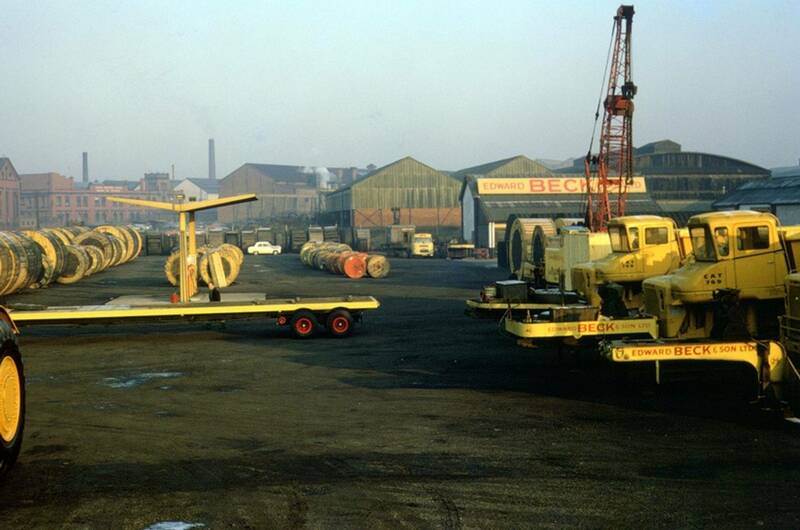 This depot shot shows part of the maintenance facilities at Greg Street. 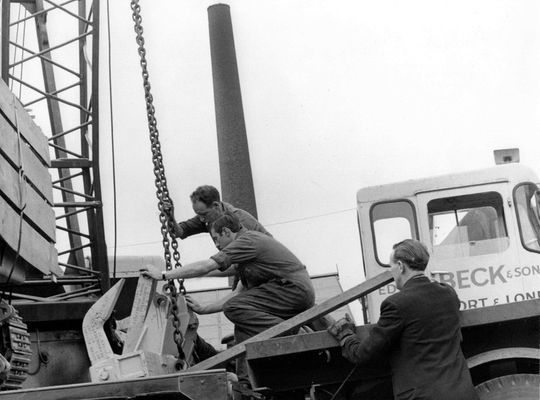 On the right a Coles Dominant 15 ton mobile crane is having an inspection to its lifting gear while next to the mobile crane a Thames Trader four wheeler tipper under goes some maintenance work. 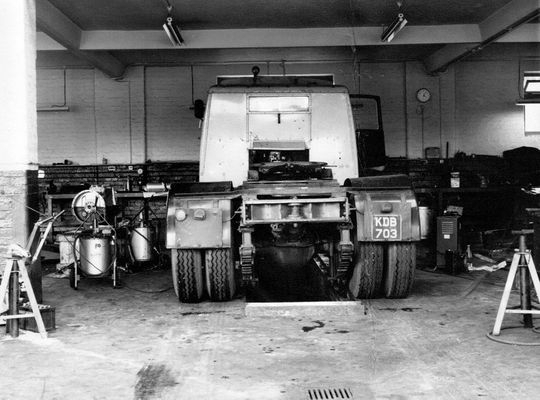 Another part of the maintenance facilities at Greg Street. 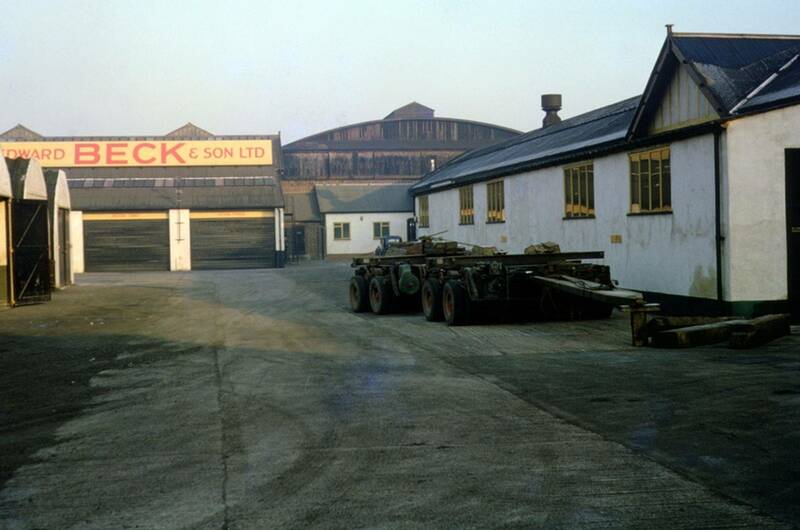 The building on the right was the trailer repair shop which doubled up as a workshop were Beck's built a number of their own trailers designed in house for specific jobs. 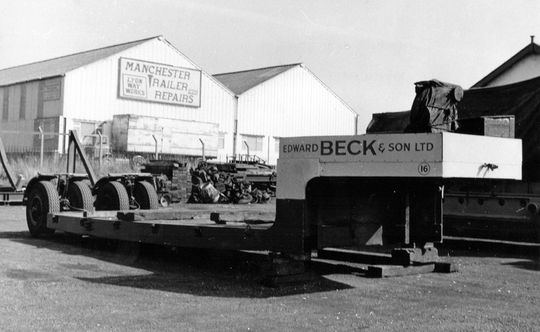 One of the company's 22 foot Carrimore low-loader's is pictured here after it had been overhauled and repainted in Beck's own workshops. 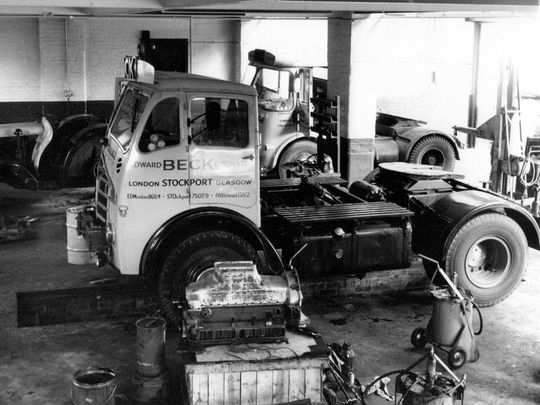 Edward Beck & Son carried out all their own repairs and servicing to their large fleet of vehicles as can be seen in this picture, taken in 1965. An FG Foden 4x2 tractor unit and an Atkinson 4X2 tractor unit are seen parked in the service bay of Edward Beck's own garage which was located within the depot at Greg Street Stockport. 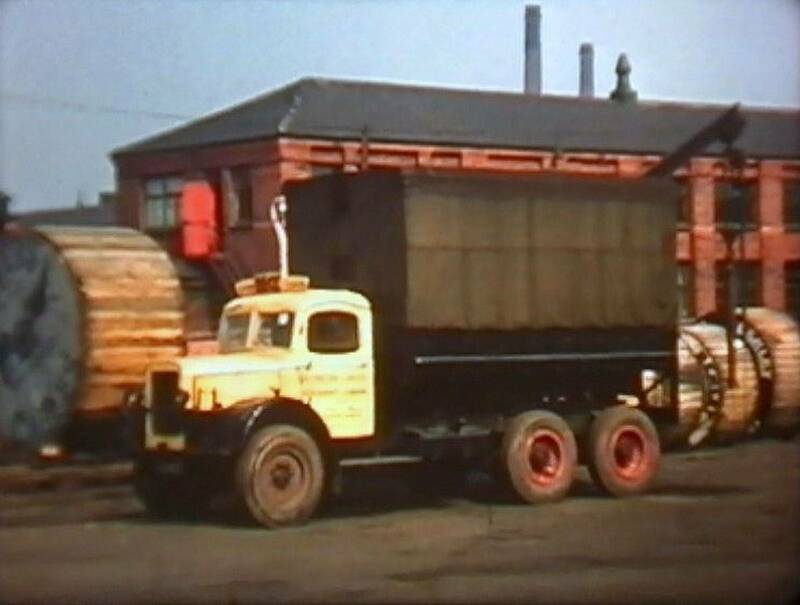 ERF 64GX heavy duty 4x2 tractor unit Reg No YDB 601 undergoes some maintenance while over the pit in the service bay at Greg Street depot in 1968. Foden 4x2 ballast tractor Reg No KDB 703 is pictured in the garage with it's ballast box removed while undergoing a routine service. 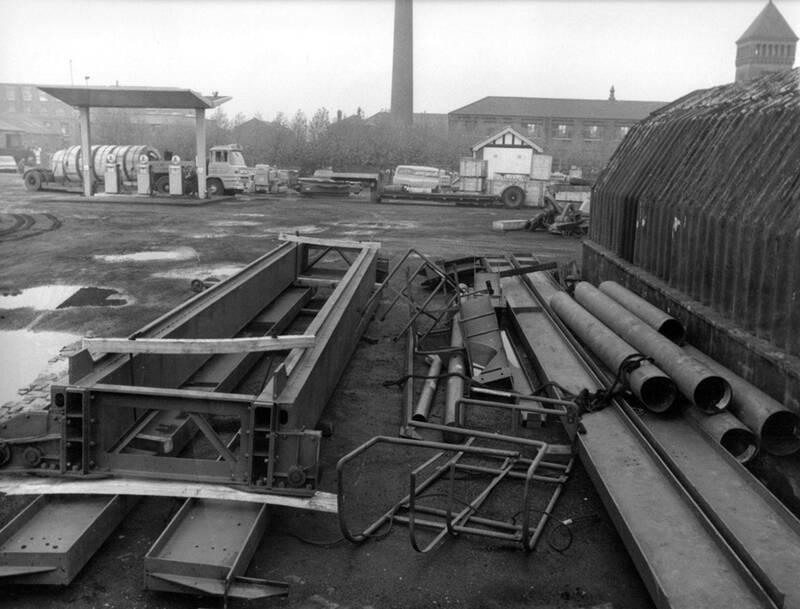 Yard shot on a quiet day showing part of the maintenance facilities at Greg Street. 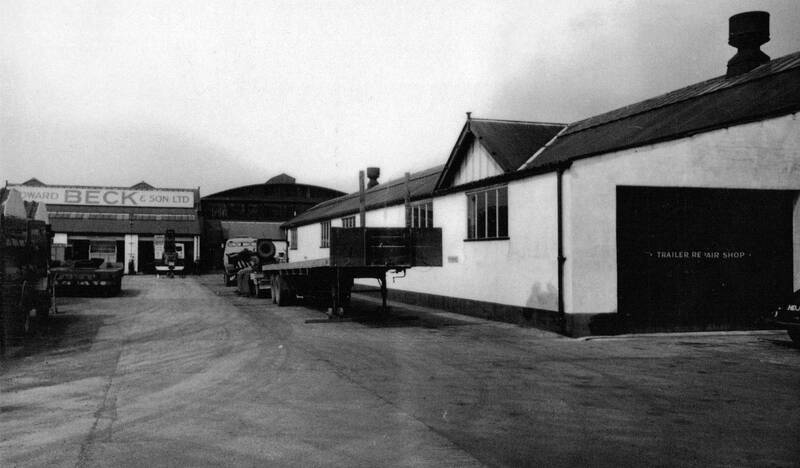 The building with the shutters was the vehicle service bays while the building on the right was used for the construction and servicing of the company's trailers. 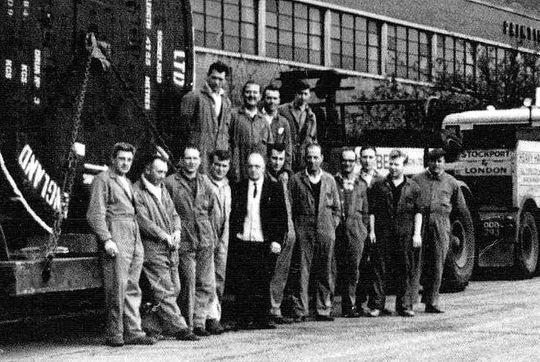 The company had a large workshop on site were amongst other things they manufactured all the headboards for their vehicles. Designed by Edward Beck they were made out of three wooden sections which gave them a sort of 3D effect and were fitted as standard on all vehicles in the fleet. 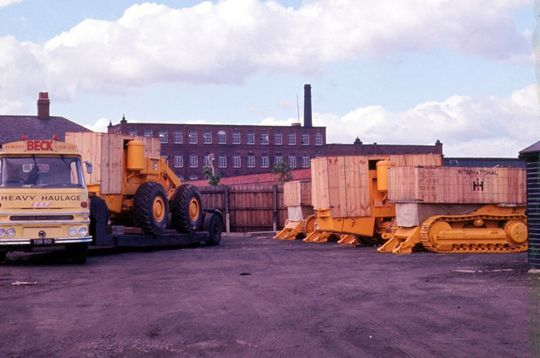 As well as storing Caterpillar heavy plant equipment the company also transported and stored a vast amount of International built plant equipment. 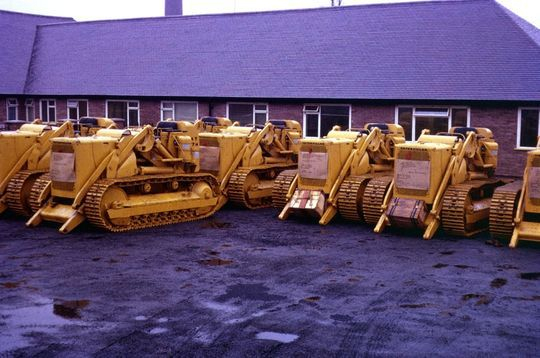 A few more examples of the vast amount of Caterpillar equipment that was stored in the depot at any one time awaiting onward delivery. More Caterpillar bulldozers stored in the depot awaiting onward delivery. The building behind is Edward Beck's purpose built head office which is pictured below. Taken in 1966 this picture shows the purpose built head office of Edward Beck & Son Ltd. 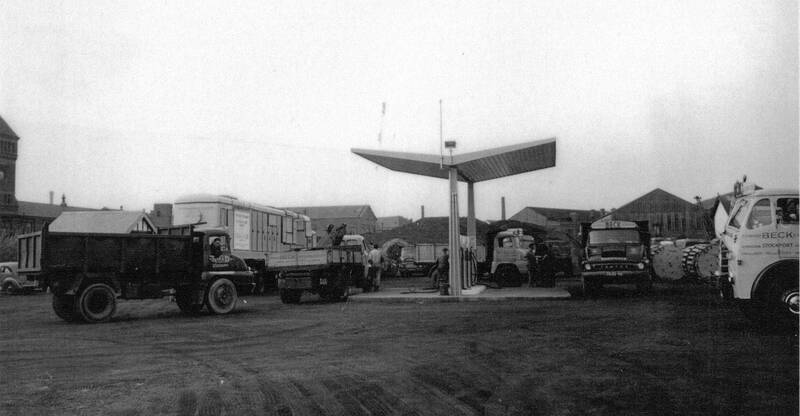 Located at the junction of Greg Street and Broadstone Hall Road South in Reddish, Stockport you can view this location today by clicking HERE. 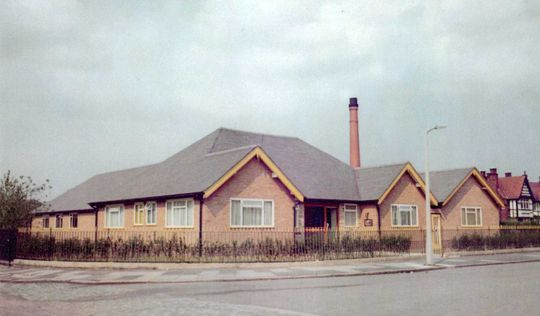 Today it is called Progress House and is occupied by the North West Police Benevolent Fund, an organisation set up to help police officers, together with their dependents, who are in a condition of need and hardship or distress.